A tutor and several accomplices were recently caught running a complex exam cheating operation in Singapore that one prosecutor called “highly sophisticated.” Unfortunately for them, it apparently wasn’t sophisticated enough to avoid getting busted. According to prosecutors, 32-year-old Tan Jia Yan ran the operation, which involved surreptitious FaceTime calls, hidden Bluetooth devices, and flesh-colored earpieces. 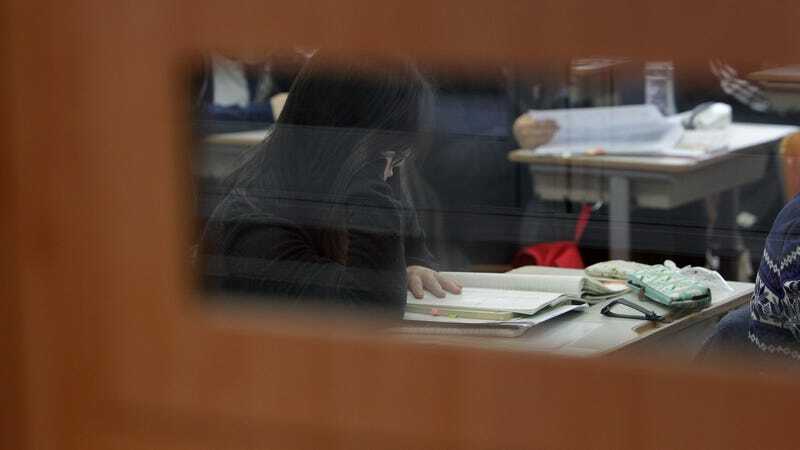 During the Singapore Examinations and Assessment Board (SEAB) exams, students wore Bluetooth devices connected to mobile phones hidden in their clothes as well as flesh-colored earpieces, Channel News Asia reports. Tan reportedly sat in on the exams, using clear tape to stick an iPhone to her shirt, hiding it with a jacket. Authorities say Tan would then FaceTime the exam questions to her accomplices, who would call the students at the exam center and relay the answers to their earpieces. The ring is accused of helping at six students, all Chinese nationals, cheat at exams in English, Math, Chemistry, and Physics. The operation started on October 19th of last year and ended a few days later on the 24th, when an exam supervisor heard “unusual sounds” coming from a 20-year-old student during an English exam. After the exam, the supervisor found a phone under the student’s vest as well as a Bluetooth device and an earpiece on his person. Tan has plead guilty to 27 counts of cheating, but her accomplices went on trial today to dispute the charges. Investigators say the principal of the tutoring center received a $8,000 deposit and $1,000 in admission fees from each student admitted. The principal allegedly promised to give the students all of their money back if they didn’t pass the test or get into a university in Singapore.